I will paraphrase here: "The suit makes the man." What about the woman? In the annals of video game history, some games don't quite get their due. For every Super Mario Bros. that gets duly recognized for its greatness, there's bound to be a couple games that, while perhaps not as ubiquitous, or universally appealing, are nearly as well-designed and realized. While commercial fortunes may elude said games, sometimes their critical acclaim transcends the almighty dollar, and a game's fortunes can be won more organically, through the slow burn that comes from word of mouth. When this kind of grassroots movement starts to take hold, it's only a matter of time before someone takes notice. "II" behind it to elicit screams of geek joy all around the world. Such is the case with the original Metroid, which was of particular interest to the youth in North America. 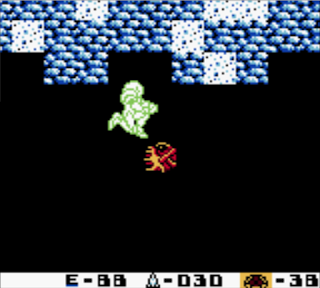 Much like it's adventure game forbear, The Legend of Zelda, which released a mere month prior in the US, Metroid became the talk of school playgrounds across the country. Kids were talking about the exploration, the cool main character, and how hard the game was, because there was nothing telling you where to go, or what to do. 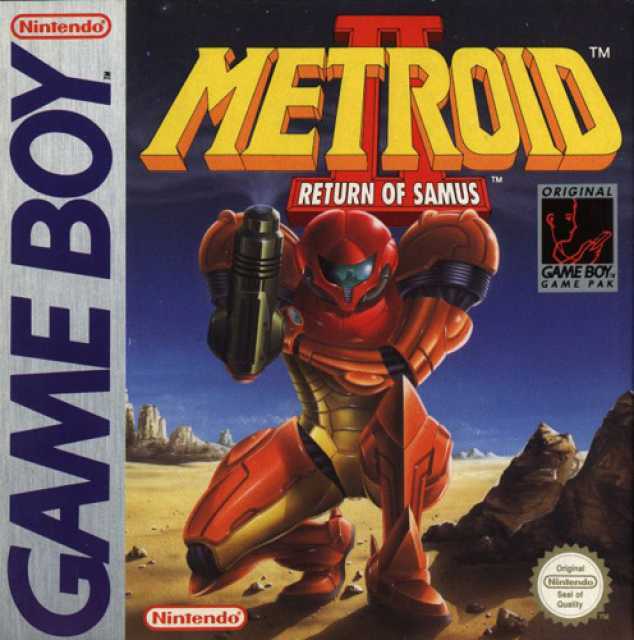 There was an air of mystery surrounding the character of Samus, and a sense of loneliness that comes from a game with no humanoid enemies, and only a scant few alien foes to dispatch here and there, with no clear indication of why you should do so, if only because they will hurt you otherwise. It was as if the Wild West had been recreated on an alien planet, and Samus was the lone homesteader, trying to get lay of the land. from the "Flight of the Navigator" movie, only with windows. And cannons. 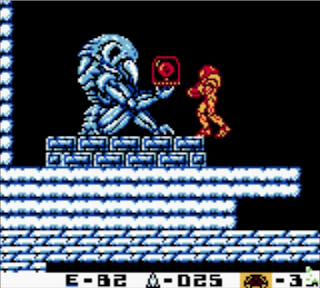 Metroid was a revelation in console game design. 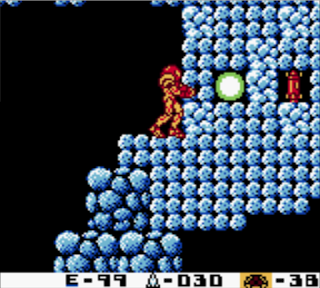 While The Legend of Zelda had a sprawling map and immediate sense of adventure, with its jaunty overworld theme and colorful graphics, Metroid immediately set out on a different path, with a darker overall feel, and elements heavily inspired by artist H.R. Geiger and the Alien film by Ridley Scott. Samus, the game's protagonist, was alone on an alien world, with a limited arsenal of weaponry to defend herself from a myriad of threats. 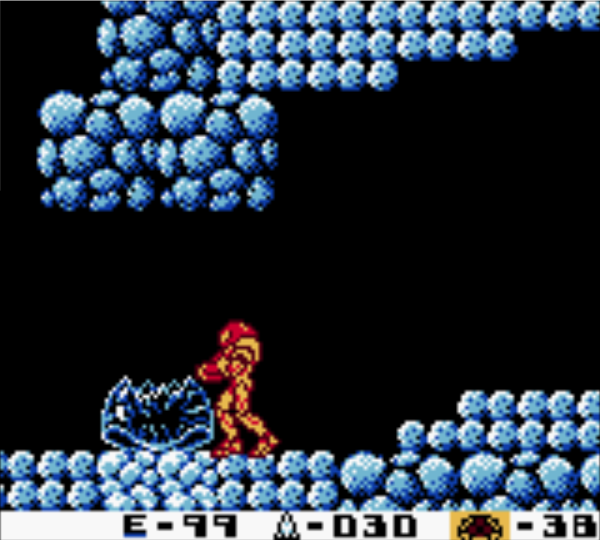 The stark, black background and unfamiliar terrain helped to define the game's atmosphere, which gave the original Metroid a sense of identify. This identity paved the way for a series of games that, while having achieved notoriety, haven't quite received the accolades it deserves. sort of flying chainsaw drill thing. The stuff of nightmares. Thanks, Nintendo. After the modest success of the original game, Nintendo followed it up with a sequel in an unlikely place, on their handheld Game Boy system. 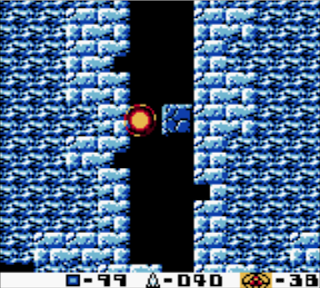 After the very open, exploratory nature of Metroid graced the Famicom and NES, Gunpei Yokoi and a small development team were given the opportunity to create a follow-up. What we got in the sequel was a bit more straightforward than its predecessor, with less backtracking, more combat, and a few elements that have since become staples of the franchise. How this sequel stacks up against its predecessor, and the games that followed, is up for debate. These save stands will quickly become your friend on this lonely world. 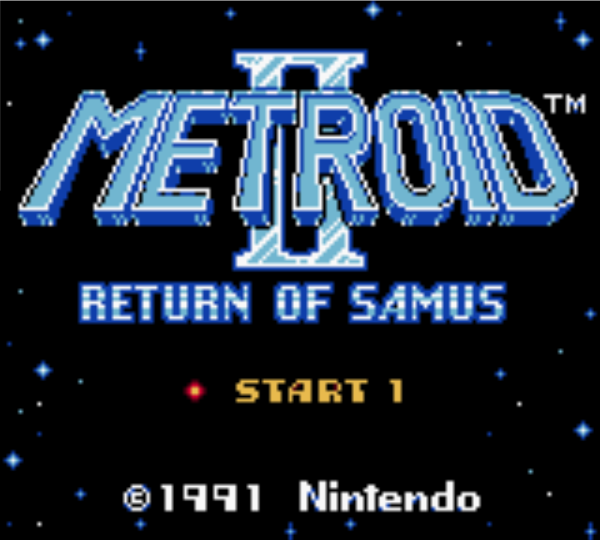 The short version of the story synopsis is, after defeating the Mother Brain in the first game, the Galactic Federation sends Samus on a mission to the Metroid life form's home world, designated SR388, to wipe out the species. After landing on the planet, Samus must set out to find, and destroy, all remaining Metroids. Along the way, she discovers that this life form has various states of evolution, and some of the more evolved forms are particularly nasty, and difficult to dispatch. Once she has successfully expunged all the Metroids from SR388, she must then face off with the Metroid Queen. Assuming she can take out the mother of all Metroids, Samus can consider it a day's work, and return home. is close by, so make sure to watch for one, so you're not caught off guard! 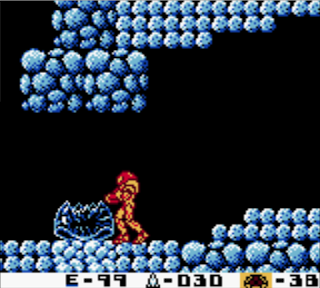 There are a number of changes to the Metroid formula that are obvious here, such as the move from console to handheld, the necessary change to 4-monochrome shades instead of color, and the zoomed in perspective, complete with large Samus sprite, because of the small screen size and lower resolution of the Game Boy. Some changes are only obvious once you begin to play the game. This is a more linear affair than the original game. Sure, you can backtrack as far as you want or need, but unless you miss a path, don't follow a path completely, or want to go back to save your game or replenish health or missiles, it's not nearly as essential to revisit the areas you've explored before. Also, unlike the original, this time Samus starts out with some abilities already enabled, such as the Morph Ball, as well as the ability to plant bombs when in Morph Ball form. She also starts out with a stock of missiles, which are necessary to kill the Metroids. health with the glowing ball, & your missiles with the, you know, missile tank. As you make your way through the game, you quickly find the Spider Ball power-up, which allows you to make the Morph Ball form adhere to any surface, as if by using some kind of sticky substance. This is essential for traversing various areas, and for reaching the locations of some power-ups, and Metroids. In addition, you'll locate missile upgrades, each increasing the maximum number of missiles you can carry by 5. You'll find the familiar Ice Beam and Wave Beam part of the way through, but you'll also discover the new Spazer Beam and Plasma Beam, both of which return later in Super Metroid. As with the original game, you can find the Varia Suit to cut the damage Samus takes in half, as well as obtain the Screw Attack, which allows Samus to cause damage to enemies when jumping into them in a spinning motion. New to this outing are the High Jump Boots, which allow Samus to jump far higher than normal, as well as the Space Jump, which allows Samus to essentially spin jump infinitely, assuming subsequent jumps are executed properly (more on that later). There's also a Spring Ball power-up, obtained by conquering a creature known as an Arachnus, that allows Samus to jump while in Morph Ball form. you lose health. Also, I'm not sure why fish have mo-hawks on SR388. 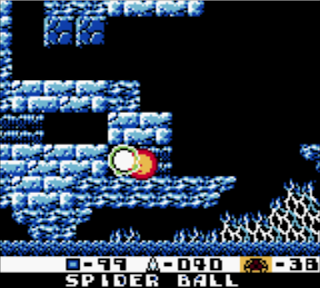 Items that are essential to the completion of the game are the Spider Ball, the Ice Beam, and the Space Jump. To make life easier, the Screw Attack is really helpful, and of course, locating as many Energy Tanks (to increase Samus' total health points) and Missile Tanks as possible, so you have enough ammo to take out the more highly evolved Metroids. You also probably won't get too far if you don't upgrade to a more powerful gun, such as the Plasma Beam, at some point during the adventure. Because this is a more linear affair, chances are, you'll likely discover most of the upgrades with minimal exploration and effort, as nothing in the game is too far off the beaten path. It's just a matter of looking at the fairly obvious tells for where to bomb or shoot to break a path through a wall or floor, and you'll find what you're looking for. taking damage before you will take more, so watch your energy closely. Graphically, this game is really on point. 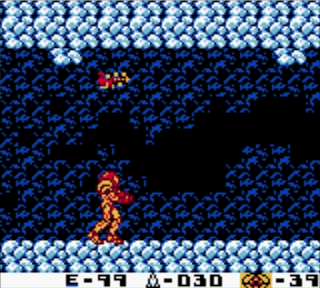 The Samus sprite is large and detailed, and despite limited frames of animation, looks great while running and performing various movements. All the areas are nicely drawn, with interesting use of different patterns and motifs that tie together fairly well, without being too repetitive. Enemies all look good, though most aren't really animated. It's a big odd, as most enemy sprites just move on screen, but don't have separate frames of animation. One particular enemy that does has a weird effect that accompanies the animation. I don't know if this was a conscious decision, to help minimize screen blurring, or to keep the focus on Samus' animation, but it's an interesting side note. that require the requisite 5 missiles to open the first time you encounter them. Of particular interest is the colorization option available, when playing the game on newer hardware. Starting with the Super Game Boy, and going all the way up through the Game Boy Advance, and Game Boy Player, each official way to play the Metroid II cartridge was programmed with a specific color palette for the game that gave Samus her iconic red and yellow suit, and colorizes backgrounds and foreground elements in various ways. I know there's some hardware trickery that can be used to sort of get around the 4-shade limitation with this special palette, though I'm not entirely sure how Nintendo pulled it off. I think the palette was tweaked after the Super Game Boy for the Game Boy Color, and for the Game Boy Advance and Super Game Boy. Playing on 2 CRT TV's, the SGB palette looks brighter and more limited, in terms of colors used, whereas playing on the Game Boy Player (which I did for my full play-through), it seems there's a wider array of color choices used, suggesting that Nintendo purposely used some additional GBC/GBA magic to accomplish that. holding a power-up in its hand, waiting for you to shoot it and claim it. "Take the bombs, Samus, for you are the Chozo-en one." In the audio department, the game is pretty much what you would expect, and that's mostly a good thing. The music in game is a mixture of slightly bouncy, hopeful sci-fi adventure music, ambient sounds, and a couple tunes that are less hopeful, and more foreboding, though nothing quite as atmospheric as the follow-up game would have, save, perhaps, for the title screen theme, with its contrasting harsh, high-pitched tones and somber melody. The iconic jingle that plays when you find an upgrade is here, complete with a couple nice percussive flourishes, for effect. The theme that plays during the final face-off with the Metroid Queen is sufficiently dark and unique as well. Sound effects are mostly good, with cool explosion effects, good weapon noises, and a scant few enemy sounds. The one area of sound that I take issue with is the annoying alarm that plays constantly when you get low on health. It's kind of cool that it changes a little bit, depending on how close you are to death, or to restoring your health, but it's still annoying. It's not quite as grating as that of most of the Legend of Zelda series games, and yet, remains a nuisance. Lots of fun places like this to sneak through walls and find hidden areas. Going into this game expecting an experience like the original game is a mistake, so if, perchance, you haven't played this game yet, understand that it takes a different approach. 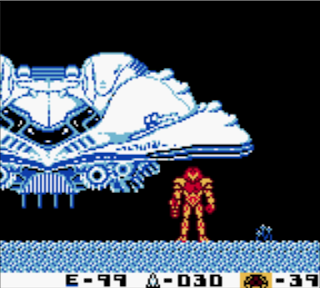 The goal here is to kill all 39 Metroid creatures on SR388, and then take out the queen. As I mentioned earlier, this is a far more linear affair. When you pause the game, you see a number in the lower-right corner, which indicates the number of Metroids you have to kill within the general area. Once that counter reaches zero, you experience a mild earthquake, and the acid that blocks your path to lower areas of the planet gets reduced, which then allows you to go deeper into SR388 to find and destroy more Metroids. After this acid reduction takes place and you move to the next area, you can pause the game, and again, see how many Metroids are in the area that you need to dispatch. seek them all out. You'll need that extra health to face the queen. 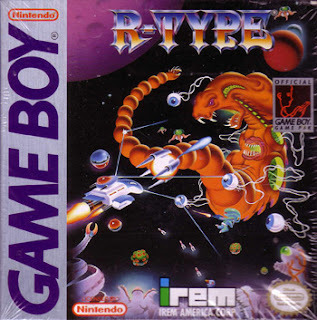 Unlike the original game, which saw you exploring large areas with no major threats, save for a few pesky enemies here and there, this game has what boils down to a succession of mini-boss fights, with many of the lower-tiered Metroids. This approach quickly become full-on boss fights, as you face off with some of the more evolved forms that take more of a pelting to down, and are trickier to defeat. A quick search of the web will reveal the strategy for fighting the queen, but if you go in blind, like I did, you may be a little stumped as to how to take her down, even with full health and missiles. After defeating the queen, instead of having to quickly escape, you can sort of leisurely stroll out of her chamber, and jump your way up and through the catacombs to reach the surface again, so you can get back to your ship. 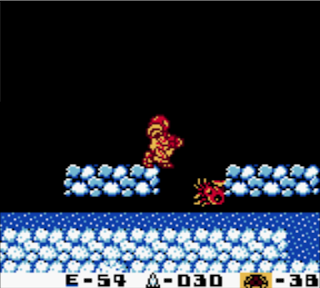 As you do so, you'll encounter an egg, which hatches, and reveals a baby Metroid that follows you. 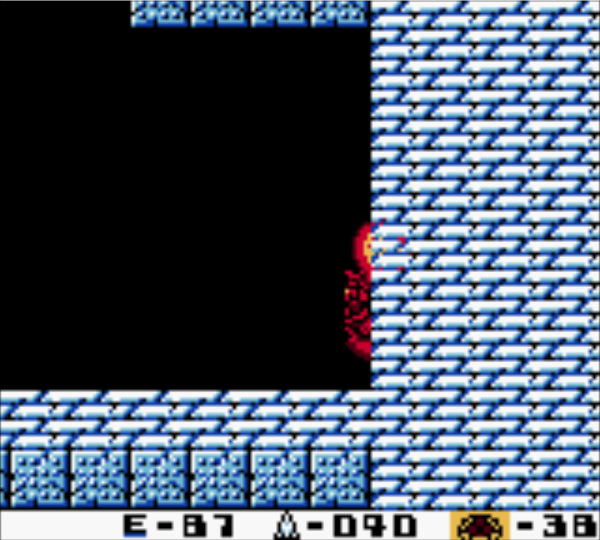 As you're escaping, this baby Metroid will clear a path for you through certain obstacles that Samus cannot shoot through, either with a laser weapon, or with missiles. This, of course, sets up the intro for the iconic Super Metroid intro, with it's famous line, "The last Metroid is in captivity; the galaxy is at peace." So unlike the Legend of Zelda franchise, which has rarely received a direct sequel from one game to another, the stories of the first 3 games in this series are all interconnected, and flow relatively well from the first through the third. stick to any surface or wall that doesn't cause her or her suit any damage. As I write this review, in the fall of 2017, it's interesting that there are now more options than ever to experience the story and game play of Metroid II: Return of Samus. Not only can you purchase an original cart, and play on some form of Game Boy hardware, but you can also purchase the game on the 3DS e-Shop. The game never received a Wii, or Wii U Virtual Console release, however. 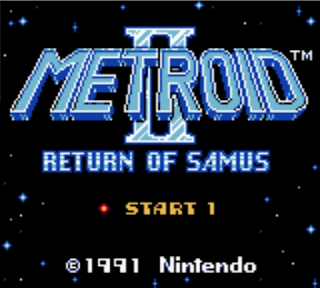 In August 2016, a fan-made remake was released, known on the web as "AM2R" which stands for "Another Metroid 2 Remake" which was released as a free download for PC. 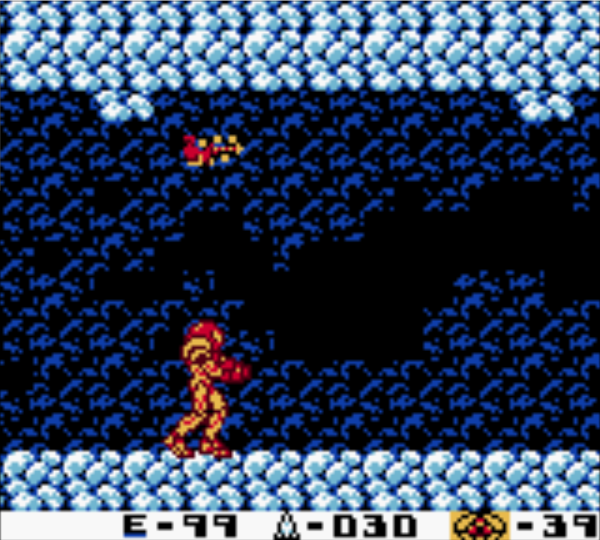 Within days, Nintendo rightfully filed DMCA take-down requests, to protect the Metroid series as their intellectual property, and the game was subsequently taken down. This happened after the developer, using the name DoctorM64, had poured years of development time into the project. Of course, as with anything on the internet these days, once it's out in the wild, and a few people have downloaded it, it's still generally available, though not officially from the AM2R web blog. Subsequently, DoctorM64 has parlayed his notoriety into a job offer from Moon Studios, who developed Ori and the Blind Forest, so at least the good Doctor landed on two feet after this went down. In addition, Nintendo has just release an official remake, titled Metroid: Samus Returns. This remake adds new elements, such as a melee parry ability, which gives you the ability to stun incoming enemies so you can then target them with a new laser sight, and blast away. I haven't purchased a copy yet, but after playing through the original, it's on my short list to buy and play through soon. Without getting too far down into the weeds, AM2R is a worthy remake, and definitely worth checking out. 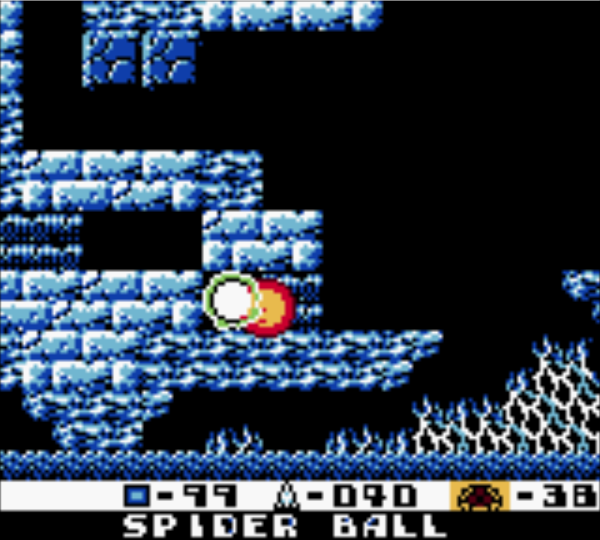 It fixes many of the typically mentioned problems with the original game: it's in full color, the perspective is zoomed out, the control is tighter, the game moves faster, and there's a greater sense of exploration, because some of the new abilities you have to find first, such as the Spider Ball. I haven't played it through to completion, but I can say that it definitely feels more like Super Metroid, and that's a good thing. The interpretations of the Metroid II music are all really well done, and worth downloading on their own, as they tend toward the Super Metroid style and overall feel. Graphically, AM2R is gorgeous, with that Super Nintendo look and feel, and the game is impressive overall. Yes, you'll need to look a little harder to find a download for it, but it will be worth your time, because it's a stunning game that takes the source material and lovingly updates it to give it more polish. I can't really recommend it enough, given the fact that it's free. "Spider Samus, Spider Samus, does whatever a Spider can...mus." Now that I've sung the praises of a fan remake, how does the original game fare? Pretty well, all things considered. The game looks and sounds great. Metroid II retains some of the lonely feeling of the first game, but without too jarring of an effect when you find a Metroid to take out. Each area where a Metroid is located, you'll see a shattered egg/pod, indicating that there's one close by, so you'll be on heightened alert. Each time you clear an area of Metroids, it's a very satisfying feeling, knowing you've opened up a whole new area to explore. The new weapons and items are cool, and you'll definitely have fun with the Spider Ball power-up, scaling walls and going all sorts of places, looking for energy tanks and missile upgrades. The Metroid encounters, especially the more evolved forms, can get fairly intense, and will raise your heart rate significantly as you rush to pelt them with missiles. This game isn't without its flaws, however. 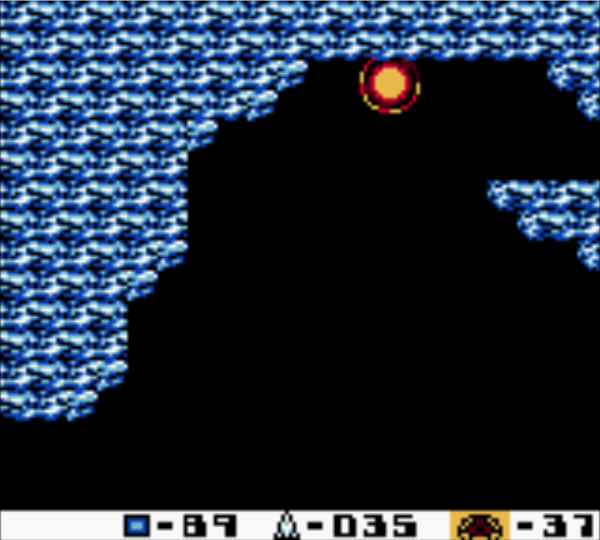 The obvious issue of the zoomed in perspective, due to the Game Boy's low resolution, is present here. 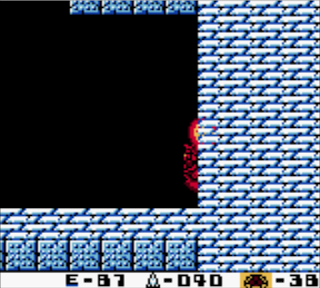 It doesn't affect game play too much, but it does hamper the Metroid encounters somewhat, because there's so little room to maneuver, it can feel claustrophobic for some of them. The Game Boy's processor speed is a factor, because it means the game moves a bit more slowly than its predecessor. That's not entirely a bad thing, because it makes some of the Metroid encounters a touch easier, but on the flipside, that means the game isn't overly difficult. As with the first game in the series, Metroid II has no map feature, so you'll either need to draw your own, or in this age of internet, just search for one. I found one that I liked and used that as my guide throughout the game. Even though this is a more linear adventure than the original, I still recommend using or creating a map. "Oh, what a feelin' - I see Samus on the ceiling." I also rather dislike when games have zero recovery time when you take damage. Yes, I know that with the energy tanks, it's more forgiving than a game where you get 3 to 5 hits and you're dead, but you can quickly run out of life in some situations. Add to this, the fact that this game has knockback, and there are a couple spots where you can be juggled to death by a pair of adjacent enemies, with no way to escape. 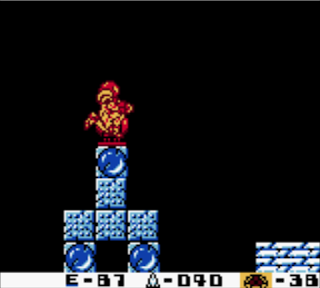 You can get knocked off a ledge by a Metroid, only to fall into an acid pit or other hazard, and quickly drain all your health. Metroids can be difficult to kill, because they're only vulnerable in certain spots, and some of the more evolved forms are hard to evade as you're attacking, so you will inevitably take damage, and often be forced to backtrack to find a health refill station before you will feel brave enough to venture to the next Metroid chamber, lest you find a save point before then. 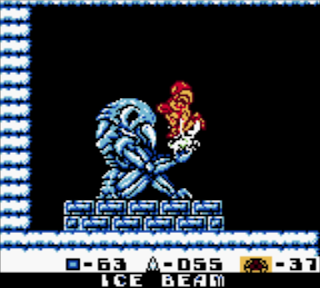 The Metroids toward the end of the game can only be killed by using the Ice Beam to freeze them, and then quickly pelt them with 5 missiles before they thaw out. If you don't know this, you'll die repeatedly until you figure it out. And even then, you'll find that, once they get to you and get on to of you, you'll drain of health really fast, and have to flail around frantically to shake them off. I understand that increases the sense of urgency in dealing with them and taking them out, but when you're so close to the end, it can be very frustrating to be downed so easily by what looks like a flying jellyfish. And finally, the Space Jump. I'm not sure if it's just me, but I have a hard time pulling it off in successive jumps. I don't know if I'm waiting too long, or what my problem is, but in some areas where it's easier and faster to use the Space Jump, or in locations where you have to, because there are hazards that prevent you from using the Spider Ball, I found myself easily frustrated because I couldn't pull it off easily. I would get it to work 2 or 3 times, only to stop spinning and fall to the ground below. Or, I would start using it, and try to time it so that I could dodge enemies, and enemy fire, only to plow right into a hazard, and plummet back down below. It wasn't enough to make me want to rage-quit, but it certainly raised my blood pressure, and put a damper on the overall experience. I know there are folks who can Space Jump like nobody's business, and kudos to them. I obviously haven't quite reached the level of Space Jump Zen Master. When it's all said and done, I believe that Metroid II: Return of Samus is still well worth playing, nearly 25 years after its release. It's still a solid game that holds up well, and won't take an exorbitant amount of time to get through. The mechanics, graphics, music, sound, and game play all hold up well enough to make it worth going back to. I will say that, if you are curious about AM2R or Metroid: Samus Returns, I would encourage you to back and play the original first, even if just briefly through emulation, so that you'll have a greater appreciation for the remake and re-imagining of the game, and also to see that, despite the improvements introduced with these newer iterations, the core game play is essentially the same, and it's still strong all these years later. 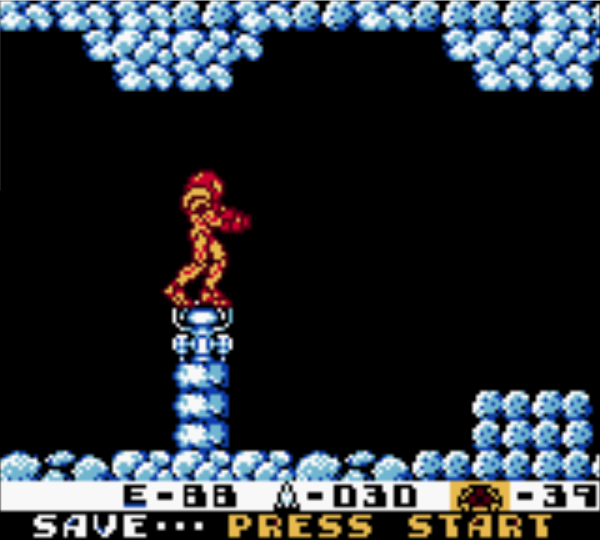 Metroid II: Return of Samus remains one of the shining examples of how to take a beloved console game franchise, and shrink it down to a mobile platform, and still make it work in a way that is fun, engaging, and worthwhile. Despite its flaws, I still had a lot of fun with the game, and would definitely revisit it in its original form, even with the availability of remakes. Highly recommended, if not downright essential for Game Boy enthusiasts and Metroid fans alike. As much as I enjoy writing Game Boy game reviews, I understand that not everyone likes to read long-form reviews as much as I do. I also really like the convenience of video platforms like YouTube, and have reached a point where I consume far more YouTube than I do traditional TV these days. I've had a YouTube presence for a number of years, with a personal channel where I've done music reviews and vinyl album collection videos, but only got started with a Game Boy and gaming themed channel a couple years back. Most of what I have up are game collection and pickups videos, but I've started a series I've dumbed "Dramatic Readings!" where I read through my written reviews, atop Game Boy game footage of the game in question. I've just uploaded the 4th video in the series, so I thought I'd highlight that here on the blog, so that, for the handful of folks who have read my reviews, but may not know about my YouTube channel, you can quickly discover this avenue as well. I'm going in order of my reviews, from the very first game I reviewed, forward through the blog, so the video reviews will always lag behind the written reviews. I'm hoping to get enough videos made to eventually catch up to the blog, so that, whenever I release a new written review, I record my video review of the previously reviewed game. This way, there's time for folks to read the written review first, and then if they miss that, or prefer the YouTube content, they can still see that video review within a reasonable amount of time after the written review is posted. I have a lot of reviews to get moved over to video, so that will take some time to accomplish. In the meantime, I'll still be playing games and writing reviews, so there will still be fresh content for the blog, as I have time to do so. As I've mentioned before, this is all a labor of love, and because I'm not funding this through Patreon or any other means, but simply buying games with my own money, playing them in my spare time, and writing reviews as I can, I go at my own rather glacial pace. I'm planning on trying to accomplish as many of these Dramatic Readings! videos as quickly as possible, so I can get into that rhythm of writing a review and then uploading the previous review video, which I would try to have prepared and ready to go so I can release them around the same time. This way, I can have new content ready to go for both the blog, and the YouTube channel, as time allows. All this to say, if you haven't checked out my YouTube channel yet, please do so, as I also post game hunting and pickups videos, and have some other stuff in the works as well. Here are the first 4 episodes of Dramatic Readings! Thank you for reading, and continuing to check out this blog. I would very much appreciate it if you would also go subscribe to my YouTube channel, and if you haven't followed me on Twitter yet, please do so there as well. As I said, I'm not doing this for money, but getting nice comments on reviews and videos does help keep me motivated, as it does for anyone, so please let me know what you think, and give me some honest feedback. Thanks again for your support! Box art shamelessly stolen from GameFAQS. like it's important. Or maybe it just thinks it's important. Who knows. I know very little about the sport of Billiards, known to mere mortals simply as "Pool" - a sport that is less agility, dexterity, and athleticism, and more a game of mathematics. Simply put, pool is all about geometry, knowing how hard or soft to hit the ball, and understanding the playing field, with all the various configurations and iterations thereof. It's a game with a strict set of rules to adhere to, and near-infinite complexity. There are a large number of different styles of play, each with its own set of specific rules, quirks, and strategies. Also, it's a game I'm pretty terrible at. Nothing screams "Excitement!" quite like this title screen. My wife's late grandmother had a pool table in her basement that the grandkids would always play during family get-togethers, while waiting for the meal, or after the meal, when the adults were upstairs chatting. Outside of that, and a handful of experiences with it at various arcades or bowling alleys, and at the local youth center, I have almost no experience playing pool in real life. I understand geometry from an on-paper, mathematical level, but the practical application of it as pool strategy always eluded me. I could line up my shot, but unless I was gunning for the pocket nearly dead-on, I always had a tendency to over or undershoot, bouncing off the pocket's angled edges, and sending the cue ball rolling off in a random direction. Needless to say, I've never developed a love for the game. an awful lot of game here, despite most pool variations being similar. That being said, pool video games are a common sight on most every platform. They're not quite as common in North America as, say, Mahjong games are in Japan, but one genre that was always present on any console during the 8 and 16-bit eras was that of video billiards. I think the Side Pocket series showed up on nearly everything during that time, and while it gained a certain degree of name recognition, I can't speak to the game's playability or quality as of yet, because I haven't played any of the games, save, perhaps, for a few minutes of the NES version as a kid. This isn't a genre I would normally dabble in, but given my desire to play every single Game Boy game, it was bound to happen at some point. Enter Championship Pool by Mindscape. Not to be cliche, but Party mode is where the party's at. Quite literally. When I initially chose this game from my ever-growing pile of Game Boy cartridges, I assumed it would be another throw-away sports title, as is usually the case with most of these games on a handheld system. Sure, loads of people STILL play Tecmo Super Bowl on the NES, and even mod it each year to add current teams, stats, etc., but a pool game? I had no hesitation in thinking this would likely be little more than a reasonably pleasant time-waster. I had no expectations going in, other than this preconception. What I found was a surprisingly deep experience that, while still imperfect, offers a lot of content for enthusiasts of the sport, and plenty to do for those of us still figuring out how to chalk up our cue. on the flip of a friendly coin." The intricacies of billiards are best explained elsewhere, but here's the 10,000-foot version: you have a table where you put together a large grouping of balls, and you use a long wooden stick to hit an equally-sized ball into that grouping of balls to split them up, then systematically use that methodology to hit successive numbered balls into various "pockets" around the table. There's 1 pocket at each of the 4 corners, and 1 on each long side, for a total of 6. If you hit the wrong ball into a pocket, that's bad. If you hit the right ball into the wrong pocket, that's bad. If you hit the cue ball, used to hit the numbered balls, into a pocket, that's also bad. And in most sets of rules, unless you're playing what's referred to as "scratch pool" in common parlance, you cannot hit the 8-ball into any pocket until all other balls designated to you have been sunk into other pockets. kid, and when playing with others, actually following. Keeping all this in mind, the essential elements to success in pool are understanding the basics of geometry, so you can hit the cue ball with your cue (the aforementioned long, wooden stick), so it can strike the numbered balls and send them careening into the pocket. If the ball you want or need to hit is halfway down the table, and there's another ball in the way, you can hit the cue ball toward a wall to bank it off that surface, and back toward the destination ball, in hopes that you'll hit it with enough force, at the proper angle, so as to direct it to the pocket in question. It sounds simple enough, but there are a lot of elements at work. How hard do you hit the ball? Do you hit it straight on, high up on the ball to create "topspin" or down low to create "backspin" instead, to slow it down? Do you hit toward the right or left side of the ball to give it a bit of curvature in a given direction? Can you bank more than once, if the other balls are in the way, or clustered too far together? All of these elements at work make pool a far more complex sport than one would imagine. Pool's just like football, right? "Ready...break!" Translating that to a video game could prove challenging, especially on a tiny handheld system with a direction pad, 2 action buttons, and 2 optional buttons, but Bitmasters pulled it off here. Controls are deceptively simple at first: use the D-pad to move your targeting reticle around to point to where you're going to shoot the cue ball. Press A to confirm targeting, and you see animations that help indicate the approximate proposed trajectory of the intended target ball. Assuming you're targeting the right ball (more on that later), and can aim it toward a pocket, you can then press A again to shoot the cue ball and hope you not only hit the intended ball, but that it then reaches its intended pocket. It's not quite that simple, however. As you're moving your target circle around, you can use the Select button to zoom in on the pool table, to get a much closer view of the action. In either zoomed in/out view, you can hold down the B-button, then press a direction on the D-pad, to move the targeting circle far more slowly and precisely, to finely tune your shot. In contrast, you can also hold a direction down on the D-pad, then press and hold the B button to move the cursor quickly, which is useful for faster navigation around the table. Pressing the B button once will bring up the power meter, and then you can hold down left or right on the D-pad to increase or decrease the strength of your shot. Press the Start button while lining up your shot, and you're treated with additional options: under the Game Control menu, choose the Set Spin option to get a "behind the cue" view of your ball, and move the stick around to determine where on the ball you plan to it it. 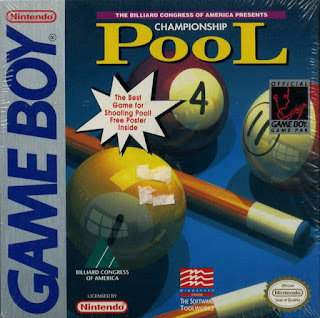 It's a surprisingly deep control scheme for a portable pool title, and was likely carried over from the NES version of the game's design. when you're a DJ, not when you're trying to will at billiards. There are other options as well, accessed via the Start button. You can quickly switch between displaying the ball numbers or not, move the cue ball (if the rules dictate you can, via a break shot, or opponent scratch), choose your zoom (instead of just pressing Select), or access the "Jukebox" (to toggle music on or off). In the Actions menu, you can choose a Special Action, such as calling a safety (where there's no clear shot), or viewing the scoreboard. You can check out a replay of the last shot, deciding to Insta-Win, if you can't handle the pressure, or choose to end the party, if you're playing one of the party modes within the game. huge help if you want a clean shot at your next numbered ball. Speaking of modes, Championship Pool offers a large variety of game modes. At the main screen that comes up, you can choose between 4 different modes: Tournament, Challenge, Party, and Freestyle. In Tournament mode, you can select whether to auto-break the balls as they're racked on the table, or do that manually. You can also choose between a standard 8-ball or 9-ball game setup. It's a single-elimination tournament bracket, so you only get one shot to fail. In Challenge mode, you can choose from one of six different billiards challenges: 14.1 Challenge (like "straight pool" but each shot must be properly called and achieved), Eight Ball, Nine Ball, Equal Offense (a series of 8 15-ball racks in a scoring contest), Three Ball (sink 3 balls in as few shots as possible), and Speed Pool (sink the balls as quickly as possible). Freestyle allows you to essentially practice on a standard 15-ball rack, taking shots and being less concerned with the full rules, but getting a feel for the geometry, game mechanics, controls, and approach of the game. especially combined with the slow cursor method to near-pinpoint accuracy. The most robust mode is the Party mode. In this game mode, there are 11 different options: Eight Ball, Nine Ball, 14.1 Continuous, Ten Ball, Rotation (similar to straight pool, but balls must be sunk in numeric sequence), Straight Pool, Equal Offense, Fifteen Ball (similar to rotation, except balls can be sunk in any sequence, and scoring is based on the ball number), One Pocket (each player has a designated pocket that they must shoot any balls into, in order to score), Three Ball, and Speed Pool. Each of these modes allows either 2 or 5 players, depending on the mode. The handy part is, each player can use the same Game Boy handheld, and players just pass it back and forth, or in a round table fashion. With so many options, one can conceivably get a lot of value out of this mode, either playing with other people, or playing every round oneself, as a means of getting more practice at each different set of game rules. "11-ball, corner pocket!" It's my signature move. Tournament mode, because it's single-elimination, is quite difficult, because you really have to have a good handle on the game mechanics in order to avoid getting "snookered" by your opponent. You also have to abide by the strict rules of either game, so that means hitting the numbered balls in sequence, and making sure to correctly pocket each one. Foul too many times, or lose because your opponent just out-shoots you, and you'll see an avatar of your opponent on screen with a greasy smile, letting you know that you're not up to the task. The real challenge comes in the form of the so-named Challenge mode, where a single mistake means game over - no scratch, no retries, you're just done. You'll need to rack up some serious time in Freestyle or Party modes, and get incredibly good at the game before you have much hope to complete a challenge in this mode. I found myself, with my limited skill and knowledge, only being able to get about 2 or 3 shots in on any of the challenges, often breaking the rack, and then not even remotely being able to reach the target ball for the rule set, and immediately failing the challenge. Enter at your own risk. ball is close to the pocket, can be difficult to sink properly. Graphically, the game doesn't do much, but it's hard to expect that from a simple billiards game. What's here is competent, however. The simple overhead view of the table is good, with a nice representation of the wood grain of the outer table, and an angled design on the carpet below, as well as the pockets, pool balls, cue, etc. The initial menu has a nice graphical effect where, when you press up or down on the D-pad to move the arrow to select your game mode, a set of pipes above and below the arrow will blow out a puff of smoke, as if to move the arrow up or down. It's an unnecessary flourish, but a nice touch, nonetheless. The text on screen during the initial menus is a little harder to read, because it resembles a manual scoreboard, but that's a nice touch. In-game menus are much easier to read, and the game's overall presentation is clean. One step away from victory, as the 7 ball will be an easy one to pocket. In the audio department, the game is pretty weak. The game only has two or three music tracks in total. One plays at the title screen, and during the game itself, and there's at least one more track that plays when you lose. There's another short tune when you win. I haven't got far enough into the Tournament mode to know whether or not there's additional music if you win the whole contest. Sound effects are utilitarian, so they get the job done without being exciting. The sound when you smack the rack of balls and break them is fine, as is the rest of the sound for hitting balls, bumping the pool table wall, or sinking a ball in the pocket. Nothing here smacks of outstanding sound design, but it fits the bill. Of all the rotten luck! Oh well, maybe next time. The real meat of this game is in the depth of the control scheme, coupled with the staggering number of game modes, but even then, it still boils down to hitting the cue ball to break a rack of numbered balls, and shoot them into various pockets. A player's mileage is going to vary wildly, depending on how much effort one wants to put into learning the nuance of the controls, and digging into each of the game's modes. True mastery of digital billiards will elude all but the most patient players, and based on how granular the controls can be, I suspect that the Challenge mode games will take a significant amount of practice before they'll be won. If I'm going to play a game that's more on the slow side, such as this, my preference is either a turn-based RPG, or a puzzle game of some sort. This kind of game, lining up shots, taking forever to determine how and where you're going to shoot, how much power to use, spin, backspin, topspin, etc. is not really for me. When I started playing this game for review, I tweeted out a statement about this game being boring. While I stand by my original assessment for how little I had played it, and how I was equally uninformed about the game's mechanics, I must amend that statement by saying that it's boring - at first. Once you begin to get a feel for it, learn the nuance and complexity of the control scheme, and begin to see some real victory for your efforts, it becomes more rewarding. Whether that's enough to justify a purchase will depend on your love, or lack thereof, for billiards, as well as whether or not this kind of slow, methodical gameplay is for you. I don't see myself coming back to this game anytime soon, but I have a much greater appreciation for it now, after spending more time with it, than I did when I reluctantly inserted the cartridge into my Game Boy. I would consider that high praise, because a game I fully expected to dislike, and ultimately lambaste in print, has become something that I found to be oddly thoughtful, well-designed, and a worthwhile experience. It's certainly worth the $5 I paid for it, and if you're a pool enthusiast, I dare say, this might be the kind of experience you've been looking for in a video game. I'll give this a casual recommendation to the enthusiast or sports fan looking for an old-school handheld fix.